Look at our huge A bed! Sorry this video is sideways. 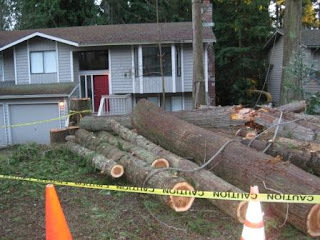 . .
What we came home to. . . This is what was happening at our house while we were on vacation. The crew will be back this week to do the backyard and clean up. I will be measuring the windows immediatly so we can get blinds!!! This weekend was spent mostly painting and making numerous trips to Home Depot. Friday night Zach painted the ceiling in the basement. We woke up, went to Home Depot to get supplies and came home to paint the walls only to find out we also needed a second coat on the ceiling. We got to work and by 4:30 or so we were all done and very proud of how awesome everything turned out! 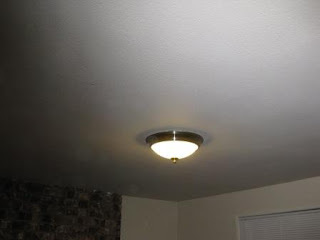 It was my first painting job and I have to say I was quite impressed with my skills. :) I absolutely love the color we chose. . .Ralph Lauren--Cottonwood, not too dark but not too light. I also painted the fireplace doors black--the gold just had to go. 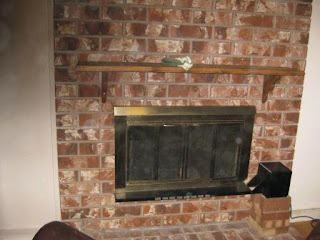 We still want to do some more updating of the fireplace with a new mantel and update on the brick but this is a start. Another big accomplishment--we came to an agreement on carpet so we should get that installed in 2-3 weeks. Once that is in we will get new moldings and window coverings and should be close to done with our soon-to-be cozy family room. I'm so excited. 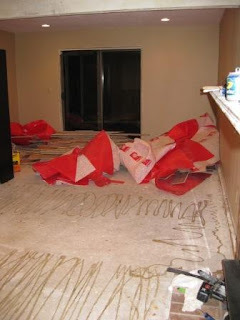 Notice the concrete, the red stuff is the old floor padding. Zach ripped this up in about a 1/2 hour--sweat was dripping off his forehead! 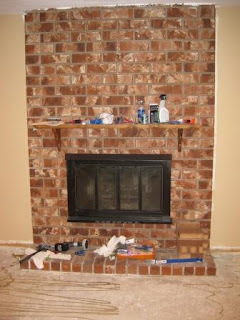 The fireplace before I painted it and before we took the blower off--it's an eye sore and we will never use it! The move happened. . .FINALLY! We were scheduled to move on the 27th but due to snow got postponed a day. Our neighborhood in Woodinville had/has quite a bit of snow so it made moving very difficult. My poor car even got stuck at the bottom of the hill for a few days. . .and just when we think its over--its snowing again!!! Anyways, we are in the house now and getting settled. We've already started a few reno's. 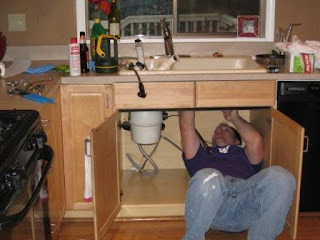 Zach installed a new shower head, kitchen sink faucet and he and his cousin Charlie installed canned lighting in our basement. The basement is our first big project. In addition to the lights we are going to paint, add a wood stove insert, reface the fireplace and add carpet, new molding and window coverings. We are very excited for all the changes. Next will be cutting of lots of trees on our property for safety and cleanliness--we have pineneedles everywhere and its driving me nuts. 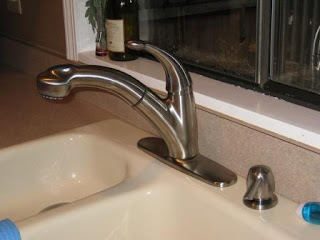 The new faucet--I wish I took a pic of the old one, it was horrible! The old lighting in the basement, there were two of these, one at each end. One didn't even work and as you can see the lighting was still dark and dungen like. The new canned lighting, softer already. We have them on dimmers as well so we can make them as bright or as dim as we want. The fireplace will look totally different in a few weeks. . .hopefully. 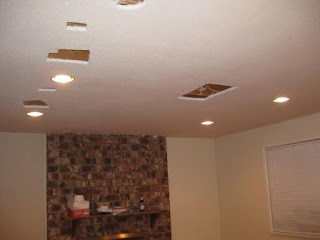 :) We also will need to patch up the ceiling--obviously! So, I know its well past Christmas but I'm just getting around to downloading my pics from the day. I had tons more but thought this one was funny. 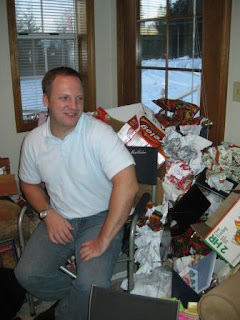 Zach being the "new guy" got positioned in the "garbage corner" so every time we opened a gift we threw our paper towards him. :) hee hee, it was pretty fun. He was a great sport. Happy New Year everyone.